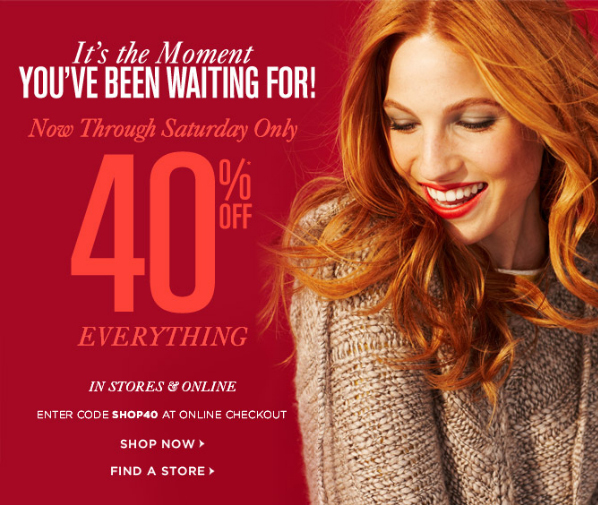 It’s what we all been waiting for .. 40% off at Loft store and Loft.com. Every season Loft begins with specialty markdowns, to it’s 30% off Preview sale and finally ends with 40% off. Most of us waited for this particular moment to purchase items that we have been eying for a month or so. I had to make my purchase last week because I was afraid my items will be out of stock. If you haven’t signed up for Loft’s Rewards card or Mastercard, then now is the time to do it. Because in addition to the 40% off, you will get an extra 15% off your entire shopping day. That’s 60% off Retail Price. Amazing deals awaits!